April Celebrations ’83 was fantastic! I flew to New York, managed to secure floor space smack dab in Queens throughout, made a new friend, and to cap it off, Guru spoke to me again. As for staying locally, I really had Jigisha -- a San Francisco disciple I had become friends with -- to thank. He knew a local disciple living in Queens who needed help promoting some meditation classes he was planning to give. Jigisha said that I could crash in this guy's room during the Celebrations as long as I agreed to do some leafleting. I hated leafleting, which amounted to standing on a Manhattan street corner trying to get passerby to, well, join a cult to be frank about it. I really hated that approach. I mean, if that was the approach to recruiting new disciples, why not just go all the way -- shave our heads, go to the airport, and play finger cymbals? I sucked it up, however. A few hours of public humiliation was a small price to pay to stay local and avoid the hinterland hotel. Ashrita wasn't happy with me when he found out that I had circumvented him and secured my own lodging, but there was nothing he could do about it. Those downsides -- having to leaflet and getting off on the wrong foot with Ashrita -- were immediately counterbalanced by the new friend I made. His name was Francois and he was a member of the Paris Center. He was laying in his sleeping bag on the floor reading comic books as Jigisha and I made our way into the room and set up camp. Like me, Francois was young, about 21 or 22 (I would turn 18 in a matter of days). He was skinny, pale, and had sharp features and orange hair. At that time, the Paris Center was led by a musical genius named Haridas (great pictures of Haridas here), and Francois was his right hand man. Haridas made wonderful choral arrangements of Guru's Bengali devotional songs and put together a choir named Song-Waves, which apparently toured France. When I saw Song-Waves perform at Celebrations, I was blown away. I particularly liked the song "Vive la France," which the group performed with a patriotic red, white and blue t-shirt emblazoned with that motto. Back at our room that night, I told Francois how much I liked the performance and the t-shirts. After so many years, I don't remember much else about that Celebrations, except the end. 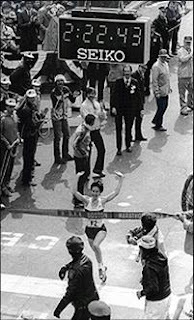 Guru wanted to go watch the Boston Marathon, so quite a few disciples travelled north to watch the race, which Joan Benoit (Samuelson) won in a blazing time (pictured above). (She would go on to win the Olympic Marathon the very next year.) Immediately afterwards, I got early word that Guru would be at a local meeting hall, so I rushed over there. When I arrived, there were very few people there and I got a seat right up front. Almost immediately, Guru took notice of me. After giving me a once over, he asked me to remind him what my name was and what Center I belonged to. Then he asked me how old I was, which was a question I loved to answer -- it made me feel special. "I just turned 18, Guru," I said. "Eighteen," Guru repeated with a smile on his face. "What do you do?" "I go to school," I said. Guru chuckled. He really got a kick out of my youth. "What was your friend's name? Do you still see him?" "His name is Charlie. I do see him at school, Guru." "Do you still speak to him," Guru asked. Guru was silent for a little while, then said: "You are a very good boy, very good. I'm very, very proud of you." That was it. I was on cloud nine. That evening Guru was going to give a concert at one of the local college campuses, so before it started I took a short train ride to my Aunt Mary's place (my mom's older sister). My mom was living in Boston at the time and we all met there. Mom and my cousin then accompanied me back to the concert that evening. A day or two later I was back at school and I ran into Charlie at the cafeteria. He asked how I was and I told him about my trip back to New York. I told him that Guru had asked about him, and Charlie seemed genuinely touched. With that, I had less than eight weeks left of school. Hallelujah!